The museum’s preservation enchantments have kept the colors bright on the scraped Freljordian vellum used to create this primitive map of Nyroth. When you squint through the glass, you can see the contrast between the carefully inked map and the rough charcoal smudges of the ancient Nyrothian’s pictographic annotations. 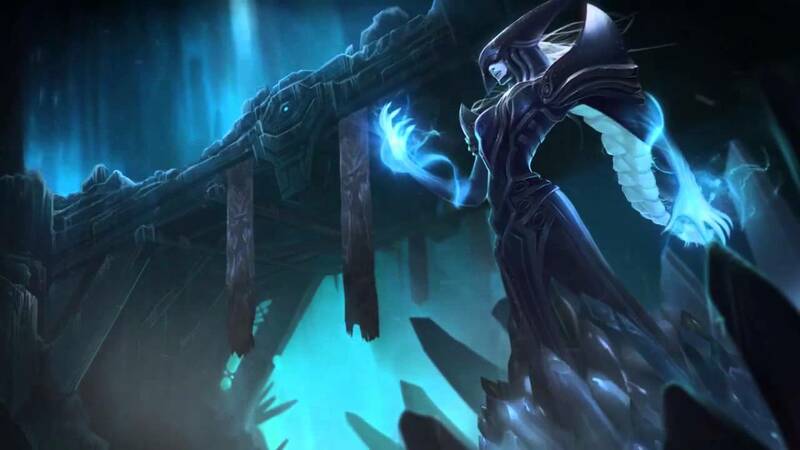 The jewel-like city-state emblems seem so small now, and the thin purple outline fencing off Krocylea in the name of the League of Legends seems so very fragile. But you remind yourself of all the blood spilled to put those little bits of lacquered stone on that map, and of the intensity of the exultation and envy that attended each placement. You think of all the mighty personages who gazed so intently upon this map as they contemplated their nations’ futures, and imagined what might become of Nyroth. This is Nyroth. Or at least, this is what Nyroth used to be. With Loresplosion III complete, it’s time to finally roll the outcomes for Lore Event VI, so we can stop being quite so vague about what happened. The Shadow Isles focused its energies on Monsku, freeing its trapped souls from the twisted arcane matrix in which they had been trapped since the cataclysm. In so doing, it encountered an abyssal fiend known as Aklathos, and drove it back into the depths. Bilgewater, for its part, granted a secret audience to denizens of several of the nothern islands, who were aware that Ionia was likely to establish a new pan-Nyrothian nation and were unenthusiastic about the prospect of trying to form a government with some of the “crazies” from the southern islands. 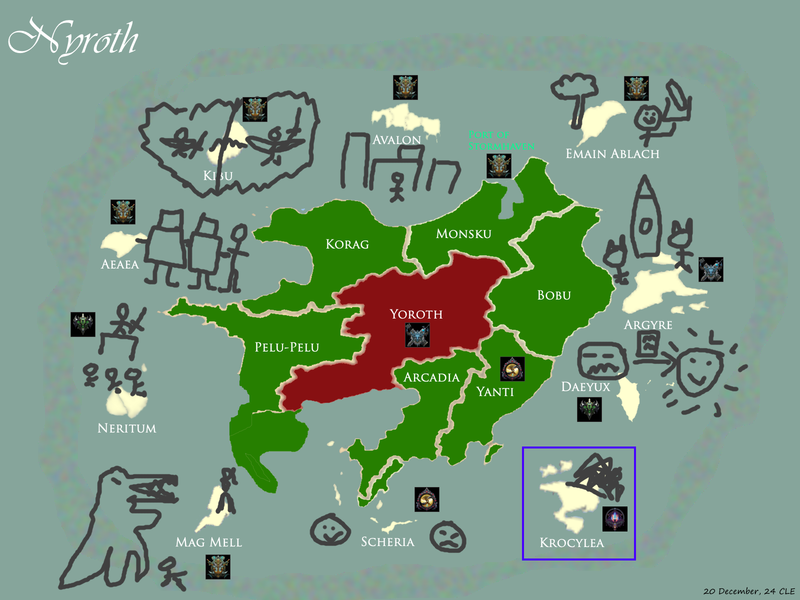 If and when the Valoranians succeeded in repairing the Yorothian mega-nexus and rendering the mainland habitable once more, they intended to rapidly settle Korag and Monsku, forming their own government. With Bilgewater’s support, they would be able to do enough trade with Valoran to thrive despite Ionia’s disapproval. Bilgewater agreed. The wildcard, of course, was Yoroth. The Freljord and Ionia ventured into the ruined central region of Nyroth, once the capital of a vast and prosperous civilization, and found the mega-nexus that linked the ten island sub-nexuses together. Damage done to the mega-nexus by the cataclysm, an aftershock of Valoran’s own Rune Wars, had poisoned the mainland and brought chaos to Nyroth’s islands. There were several possible solutions: merely stabilizing it to prevent further deterioration, or replicating the resonance from one of the islands’ sub-nexuses on a much larger scale, or endeavoring to undo the damage done by the cataclysm and restore Nyroth to the way it was long ago. They chose this last and most ambitious option. Not since the height of the Rune Wars had any Valoranian mage sought to reshape Runeterra so drastically. Even with the best minds of Ionia and the Frostguard working together, they could not say what the consequences might be. If you’d like to watch the rolls play out, you can view the recording here. I’ve also typed out the resolution details below. Aeaea: 1. Aeaea, that bounteous land of fruity drinks, automata, and Desmeya, begins drifting toward Nyroth. Desmeya, who is really just so great in every conceivable way, uses her powers to prevent a direct collision; Aeaea now lies within the bay of Korag. She finds that her dominion now extends through all of the region’s factories and mines. (Automata City, here we come.) There may be some discussions with the Shadow Isles, but surely skeletons and robots can learn to get along. Well, there you have it. Good job not breaking it, heroes. I guess when you get the Frostguard and Ionia together, they can actually pull off some pretty amazing magic. Nyroth’s mainland is habitable once more. In some sense, it might even be said that Valoran has made amends for the devastation it unknowingly inflicted through its Rune Wars. The principal remaining task for wrapping Nyroth is to organize a post-arc poll for each faction. We’ll try to get that up in the next couple of days. The outline is pretty clear, though. With Aeaea controlling Korag, at least assuming the Shadow Isles is cooperative, the Northern Confederation will surely achieve its goal of independence. This will leave Ionia with a bit of a political and diplomatic puzzle, but isn’t that what they live for? We’ll want to have the post-arc decisions shape these outcomes somewhat, but I think we have enough of a picture here that we can finally start talking about the universe post-Nyroth without resorting to tons of ambiguous language. Well done, Summoners. We had a storyline not end in complete catastrophe. People should be popping champagne around the Institute. Ionia and the Freljord have earned bragging rights forever. Bilgewater now has a market large enough to sustain its astonishing growth. And while other factions speak rather figuratively about “bringing Nyroth back to life”, the Shadow Isles have managed to do so rather more literally, repopulating regions of Nyroth that have been dead for a thousand years with their former inhabitants in newly undead-ified forms. Granted, most Valoranians would find that profoundly eerie, but from the Shadow Isles perspective, everything’s just peachy. And, of course, here’s the discussion thread. Soo now SI has influence over both monsku, korag, and pelu-pelu (trough neritum)? And Ionia. Freljord and Ionia. Let’s be honest we would’ve screwed up so hard without their backing.